This moderately fast growing Clematis is ideal for covering an unsightly wall, fence or building as it requires maximum support or grown up a trellis, pergola or over an archway. 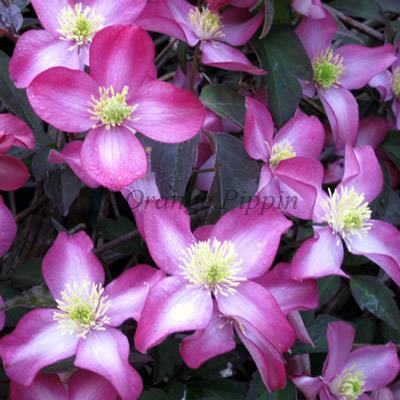 Clematis montana 'Freda' bears the most beautiful deep pink flowers, opening almost red during the late spring and early summer against bronze tinted, green leaves. 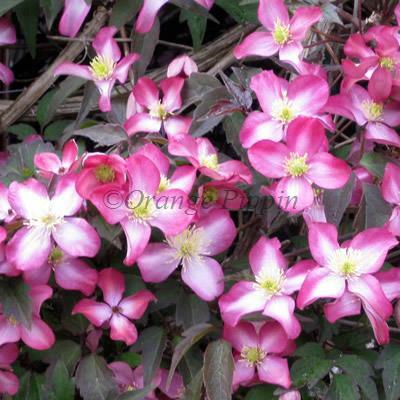 Less vigorous the Clematis montana 'Rubens' making this the ideal choice for the smaller garden. Clematis montana 'Freda' was raised by Freda Deacon of Woodbridge, Suffolk, England ad introduced by Jim Fisk of Fisk's Clematis Nursery, Suffolk, England.